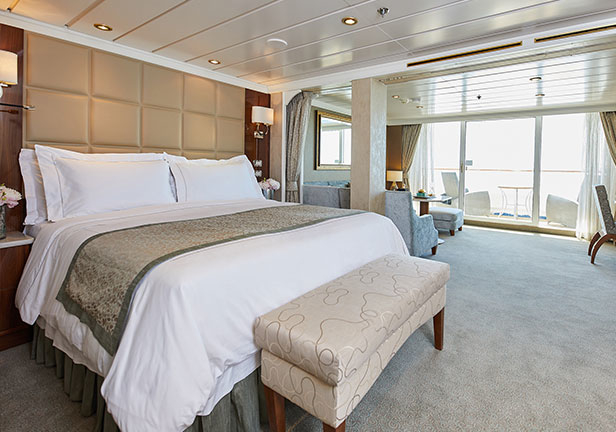 When you sail aboard Seven Seas Mariner you experience near unrivalled luxury. With four outstanding dining options, generous amenities and spaciousness, not to mention a staff to guest ratio of almost 1:1, Seven Seas Mariner is a cruise ship that offers the absolute highest service and a cruise experience you won’t forget. Choose from one of our fantastic restaurants and enjoy cuisine of the highest calibre. Compass Rose – the flagship restaurant of the Regent Seven Seas fleet, featuring an exceptional variety of European-inspired Continental cuisine. La Veranda – spacious and comfortably casual, La Veranda serves breakfast and lunch. It then transforms into Sette Mari in the evening for a casual, intimate dining experience. Pool Grill – the ultimate come-as-you-are dining venue. Come straight from sunbathing or a swim in the pool and enjoy grilled-to-order burgers, seafood, sandwiches, salads and more. In the evening, watch the sunset whilst indulging the flavours of a casual gourment meal. Prime 7 – setting a new standard, this glamorous restaurant allows you to enjoy classic steakhouse cuisine with a modern flair. Signatures – enjoy the full diversity of French cuisine. Preparing authentic, decadent French cuisine is an art form and our seasoned chefs are proud to serve it for your enjoyment. That’s not all – if you fancy coffee or snacks throughout the day, you can pay a visit to Coffee Connection. Alongside a selection of coffees, there are breakfast and lunch options as well as nibbles available for when you need a little bit to eat in the afternoon. Seven Seas Mariner also features spa and fitness facilities, including the Canyon Ranch SpaClub for massages, beauty treatments and more. The fitness facilities include a jogging track, golf cages, paddle tennis, as well as free weights, treadmills and other equipment for those that want to hit the gym during their vacation. The Reception Desk is open 24 hours a day. Our staff are happy to help, answering your questions and providing any general assistance you may need. Our ships have WiFi throughout for guests with their own laptops. There are also computers in the staffed Internet Café, which is open round the clock. Printers, e-mails, Internet access and Wireless access throughout the ship are all available for a nominal fee.